The Boonah Show Society is made up of hard-working, local, people who care about their community. It was formed in 1897, (and held its first Show in 1898), making it the oldest Community Organisation in the District, other than School and Church groups. The Boonah Show Society is about to stage its 118th Show. If you do the maths quickly in your head, you will see that this does not quite add up. This is because two shows were not held during the War years of 1941-42. 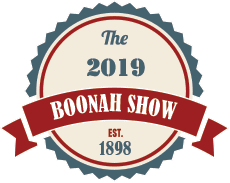 Today the Boonah Show Society has a much bigger role than when it was formed, including the maintenance of the many facilities situated on the grounds, including a caravan park. Most of the land is owned by the Department of Natural Resources, over which the Show Society has a Deed of Grant. A small portion of land, on which the Caravan Park is situated, is freehold. The Show Society is not under the control or management of the council – we manage it all ourselves. Our mission is to run the annual show to promote the district and to maintain and develop the grounds for community use. We think we do both those things successfully. It’s also important to remember, that with the exception of two part-time paid staff, we do it all with volunteers. In 2010, the ‘Boonah Show’ was chosen as the Scenic Rim Community Event of the Year. It is a strong focus for community spirit and provides hundreds of thousands of dollars worth of economic benefit to the town and district each year, as well as providing social, sporting and cultural opportunities. The Showgrounds is the home for Fassifern Horse & Pony Club, Boonah Rodeo & Camp Draft Assn, Fassifern Netball Assn, (these are major Stakeholder groups who contribute a minimal dollar amount for the use of the Showgrounds), as well as the Boonah Girl Guides and Boonah Poultry Club. Various other Community Groups hire the venue for Equestrian events, Cattle events, Car Club & Caravan Club events. Many private parties & functions are also catered for in the Dining Hall. Obviously the work involved in running this organisation is huge – we work through committees to get the job done. With a strategic plan that sets our direction, we have a management committee of 12, membership of over 100 and that’s growing (but there’s always room for more if anyone out there would like to join the team), a Junior Show Society of around 40 and many sub-committees such as Night Show, Show Ball , Development Committee & Triple S Club. First of all, it makes our area a better place to live. It’s not just about bringing money into the district. Just as importantly our work puts our district on show – promotes its opportunities and attractions and lifts the district profile. It maintains local traditions and our country way of life that people treasure and that is part of the brand used for tourism here. We all know that the Boonah showgrounds is in the centre of town, but we believe the Boonah Show Society is at the heart of this community – working to make it proud of what it has achieved so far and helping it to dream big about its future. An indoor Sports Pavilion, consisting of 2 full sized Netball, Basket Ball or Futsal courts, or 3 Indoor Cricket Nets, a Gym, Offices, Meeting Room, Toilets & Change Rooms, Activities Hall, Kitchen, Food Court, Bar, Beer Garden & Grandstand. This facility would replace the existing Pavilion, Meeting Room, Dining Hall and adjacent toilets, and would be built in the existing location of these buildings. At show time, the court playing area would become the pavilion for all the displays. The old pavilion is over 150 year old and no longer adequate for our needs. The Dining Hall, Toilets & Meeting Room are all in need of extensive repairs and maintenance. Grants and funding is not available to do this, but funding is available from the Department of Sport & Recreation for a Sports Pavilion . There is no other facility in our District to adequately cater for the indoor sporting needs of the district youth. Does Boonah need an Indoor Sporting Centre? A Feasibility Study was completed and the result was positive. A copy of this report is available on request. What will happen to the old Pavilion? Everybody agrees that they do not want to see this building demolished. Every effort will be made to find the pavilion a home in our District. Perhaps at the Templin Historical Village to house local memorabilia, or a great Winery Cellar Door Sales/Reception Centre. Plans for an undercover, multi purpose Equestrian Centre to replace the ageing Rodeo Arena were drawn up in 2002. No action was taken at that time, for various reasons. However, they still exist, and the Show Society is calling for expressions of interest from any user groups to work on this project. Why would you want to become involved with the show society? Looking for a new interest, or want to learn new skills. Want to meet new people, make new friends. Want to put something back into the Community. Have retired and need something to do in your spare time. People with skills in marketing, administration, computer skills, business management, fundraising, grant writers, catering, mowing and grounds maintenance, WH&S qualifications, stewards for any of the 30 different sections of the show – as much or as little you can spare.